Showcases describing the capabilities of our team. We have recently published a study in which we were asked to design a peptide that could block the interaction between the proteins HNP1 and CCL5. Such peptide has potential therapeutic value, since the interaction between HNP1 and CCL5 is involved in inflammatory responses, as are occurring in the onset and development of atherosclerosis. 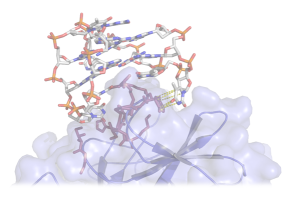 Applying extensive structure analysis, molecular dynamics simulations and in silico prediction of affinities between a series of proposed peptides and the binding partner, we were able to select a small series of potential peptide inhibitors, which were subsequently synthesized. One of the proposed peptides was characterized as a strong inhibitor which could be used in vivo to disrupt the CCL5-HNP1 interaction in a mouse model of myocardial infarction. The results of these studies have been published in the well known scientific journals “Science Translation Medicine” and in the “Journal of Medicinal Chemistry”, while a patent has been filed for the use of the identified series of peptides in the prevention of inflammation pathways. With this project we demonstrate that we can apply computational methods to assist experimentalists in the drug development process. More importantly, with our approach we can significantly reduce time and cost required in drug development. In this case, the SKY peptide contains 9 amino acid residues; and was extracted from a total of 512,000,000,000 candidate peptides. Evidently, to synthesize and test the activity of all candidate peptides would be impossible. However, with our method we proposed only 10 candidate peptides for in vitro testing. Through our collaboration with Prof. Lutgens (AMC, Amsterdam) we have been involved in the discovery and optimization of small molecules, targeted at the intracellular adapter protein TRAF6. TRAF6 is involved in signalling through the CD40 receptor pathway, and was earlier discovered as being a potential target to reduce atherosclerotique plaque formation. 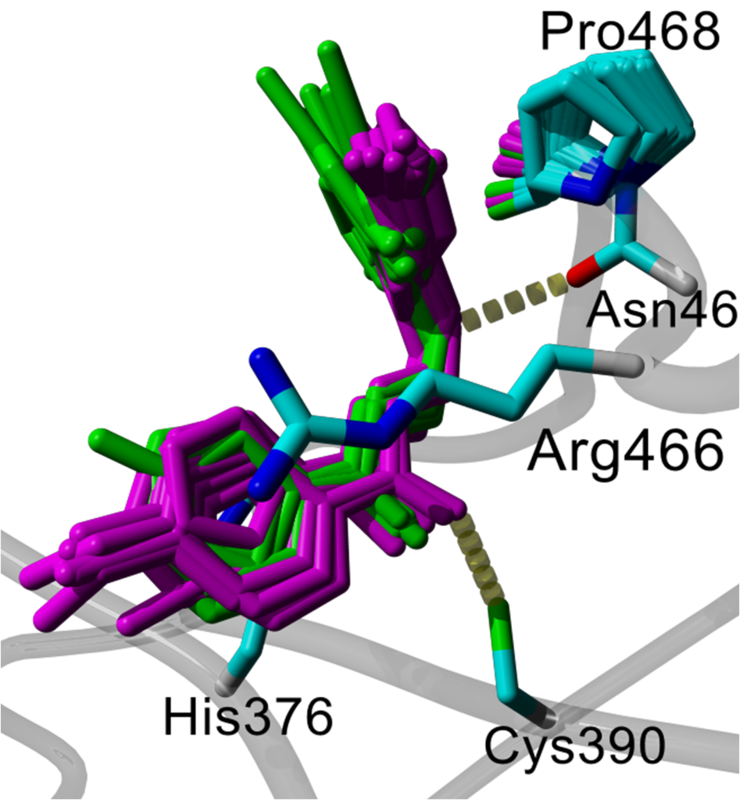 Through several rounds of in silico ADME/Tox filtering, virtual ligand screening and subsequent in vitro screening, we were able to select from an available pool of >20 million available molecules a number of potential inhibitors and thus provide a series of novel molecules with in vivo halfmaximal activities that are within the nM range. Moreover, these molecules show no signs of toxicity. This work has resulted in a number of important publications and a patent has been filed on the use of these molecules to prevent inflammatory disease, including atherosclerosis, sepsis and rheumatoid arthritis. binding pose of a compound series, giving insight into the structure-activity relationship (SAR) of the series: purple non-inhibitory compounds clash with some of the chemical groups that form the binding pocket, whereas green inhibitory compounds fit within the pocket, presenting productive interactions. In vivo analysis of the two best compounds reveals their ability to decrease atherosclerosis in ApoE -/- mice who received the compound during 6 weeks. 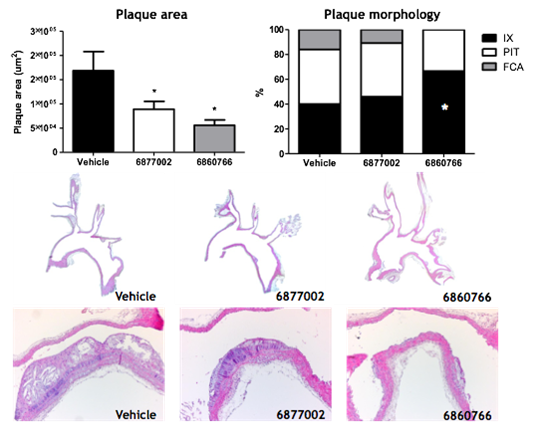 Plaque areas are reduced, while plaque morphology of the treated animals shows a more stable plaque phenotype. Overall reduction in plaque content is clearly visible from the representative aortic arches shown. In an in vivo mouse CLP model of sepsis, mice received a single administration of either of two best compounds, prior to the CLP procedure. Survival of the animals was significantly increased. After having observed that the in vitro cytotoxic activity of purified histones could be inhibited by the addition of heparin, we sought to use this property of heparin in the in vivo neutralization of histones, given that their contribution to septic disease had prior been described in literature. By designing a procedure to engineer a non-anticoagulant fraction from unfractionated heparin, we were able to obtain a heparin fraction devoid of anticoagulant properties. Such heparin would have potential application in the treatment of sepsis patients, where extracellular histones are majr mediators of death in the disease, while currently there is no pharmacological treatment of sepsis available. Although conventional heparin has cytoprotective properties, its use is limited by the effects it has on the coagulation status of patients, who often have a bleeding tendency, due to excessive consumption of coagulation proteins (DIC, disseminated intravascular coagulation). In vivo administration of non-anticioagulant heparin was able to provide protection to animals in several models of inflammation and sepsis. This work has been described in a recent publication in “Blood”, a foremost journal in the field of Medicine, moreover, a patent was obtained for the use of non-anticoagulant heparin to treat inflammatory disease and sepsis. In vivo model of sterile inflammation. Mice received an injection of 30 mg/kg Concanavalin A in the absence (Sal) or presence of our heparin analogue (HA). 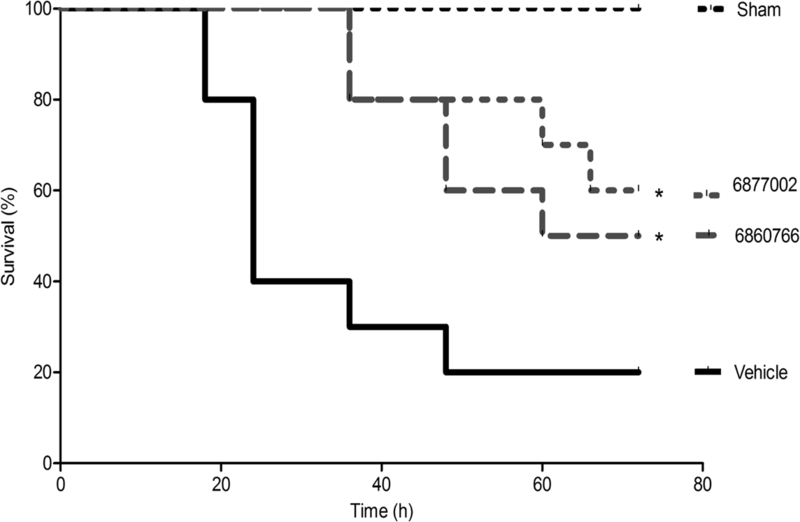 Survival time was dramatically increased by the administration of heparin. 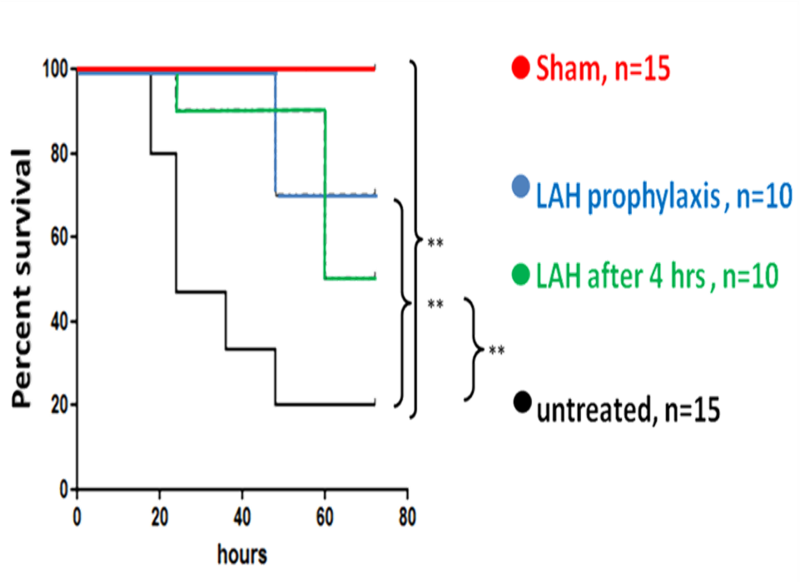 Administration of low-anticoagulant heparin (LAH) in a mouse CLP model of sepsis. 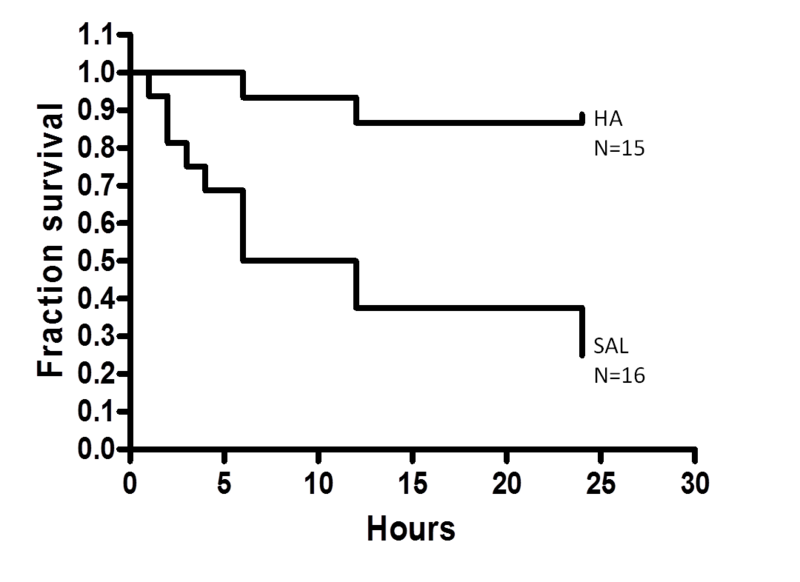 Animals received either no drug (black line), or received the drug prior to the CLP (blue) or 4 hours after the CLP (green). Survival benefit in the animals receiving the drug was strongly significant. The sham group did not undergo the CLP procedure. In collaboration with the group of Dr. Villoutreix we were the first to show that membrane binding domains, like the C-domains of the coagulation cofactors V and VIII can be targeted by small molecules that are discovered through virtual ligand screening. We identified a series of compounds that were able to inhibit the binding of the C-domains of FV and FVIII to lipid membranes. 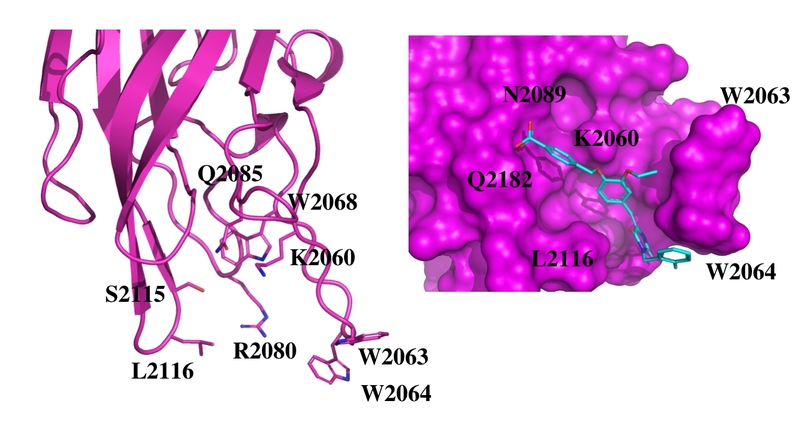 The IC50 values for these compounds were in the lower micromolar range, whereas they showed activity toward both the homologous C-domains of FV and FVIII, but not to unrelated membrane binding proteins. Having pioneered these type of compounds, the description of these findings were published in the well known journal “Proceedings of the National Academy of Sciences USA”. Later these compounds were further fine-tuned to specifically bind to the FVIII C-domains, in a study published in “Blood”. While the study received some criticism since our active series contained one so-called PAIN (pan inhibitor assay inhibitor), the most active compound was not a PAIN and could inhibit blood coagulation in full blood and in plasma. Description of the target site in the C2 domain of FV and binding pose of the top active compound, when bound to this domain.